Pepper Fewel got into the upscale camping business by necessity and personal preference. The overnight business at her Cherry Wood Bed, Breakfast and Barn in Yakima, Wash., was spilling out of the farmhouse, so she started putting guests in 20-plus-foot-tall teepees that overlook a working farm and horse ranch. "I'm not a true camper in any way, shape or form," Fewel says. "So I did what I know I would like to do. I love the shape of the teepee, and I thought, 'If I were to stay in this, I wouldn't want to stay on dirt.' So we put in a floor, then beds." The teepees were meant as a practical solution to Cherry Wood's growing pains, but they soon became an attraction in themselves: They're booked every Friday and Saturday through October, and Fewel notes that bookings for horseback rides to the nearly 20 wineries surrounding the ranch grew 25 percent over the last year. The transformation of Fewel's business is part of a trend called "glamping" (a mashup of "glamorous camping"). The trend has roots in the U.K., but in the U.S., savvy entrepreneurs are discovering that it can do what a 200-plus-year tradition of American outdoorsmanship couldn't: It's making the wilderness an attractive vacation getaway to those who've never pitched a tent or lit a campfire. "One day back in 2003, a lady came to stay with us from New York, and she said, 'Oh, this is glamping; it's upscale camping,'" Fewel says. "Of course a New Yorker would have brought that up, right? And I said, 'That word is so cool.'" From a distance, glamping looks like camping--a circle of tents, illuminated by campfires--but look again. The tents have king-size beds with designer linens. The meal cooking on the fire isn't franks and beans but prime rib, tended by a gourmet chef. Bored kids mess with their iPads (there's complimentary Wi-Fi), the family dog sleeps on a generously sized wooden deck and parents relax in lounge chairs, sipping cocktails and chatting idly. In the distance a coyote howls, presumably asking if the coq au vin is ready, and what kind of wine he should bring. But glamping resorts are more than campsites with hotel-like amenities; they are an entirely new and different strand of the hospitality industry, one in which visionary entrepreneurs can build successful resorts from the ground up without burning the ground to do it. Larry Lipson, the co-owner and managing director of The Resort at Paws Up in Greenough, Mont., discovered as much in June 2005 when Paws Up, a working cattle ranch the Lipson family has owned since 1998, added its first luxury tents--nestled between the banks of the Blackfoot River and Montana's famed Big Sky. "Over the course of the spring and summer of 2010, we turned away well over a hundred reservations because of lack of availability," Lipson says, adding that this year's bookings are selling so briskly that he expects to make his budget for 2011 six months early. "We have not only made each successive camp that we've built more luxurious than the previous one, but we've also increased the nightly rate," Lipson says. "We've discovered that there is very little price resistance among those who want to experience nature without giving up the creature comforts of a fine hotel. We like to refer to it as 'nature served on a silver platter.'" Outdoorsy entrepreneurs looking to hop on the glampwagon should be encouraged by the sheer number of bodies fleeing the cities every weekend, fully loaded with gear. According to the National Sporting Goods Association (NSGA), a not-for-profit trade association serving the outdoor recreation business, some 44.7 million Americans went camping last year, and outdoor retail behemoth REI enjoyed sales of $1.66 billion in 2010, a 14 percent increase over the preceding year. But even those who love camping have a shelf life. That same NSGA study points out that most campers are between 25 and 54 years of age and skew male (51.7 percent to 48.3 percent). Youngsters ages 18 to 24 don't seem much interested, and adults ages 55 and up prefer to camp in their Barcaloungers. But by removing the discomforts and inconveniences of tent camping, glamping can bring some of those lost souls back to nature. Fewel says that Cherry Wood's visitors are about 60 percent female, and that many of them are first-time campers. "I sometimes have to start their campfires," she says. "Lots of them don't know how to do that." In Montana, Paws Up is pulling in those bored kids and reluctant adults at per-tent rates that range from $820 to $1,620 a night. "We have two markets: families and couples, including honeymooners," Lipson says. "The parents within our family market tend to be between 35 and 65. We've also seen a great deal of adventurous family matriarchs booking luxury camping vacations for their extended families. And our couples' market continues to grow at a fast clip: We introduced Moonlight Camp, our adults-only luxury camping offering, to meet the demand of couples looking for romantic getaways. Those couples range in age from 25 to 65." Lipson notes that a third market for Paws Up is hosting group and corporate retreats. 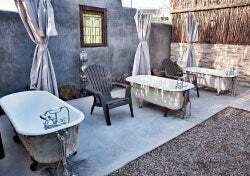 Once at the ranch, those families, honeymooners and groups settle into the swankiest accommodations one can find--outdoors or in. Every one of Paws Up's 405- to 1,030-square-foot tents has electricity, wood flooring and housekeeping services. Some even have in-tent bathrooms with jetted tubs and heated slate floors. The example set by Paws Up is inspiring, but to be fair, the resort is located in some of the most beautiful wilderness in America. Building a resort in a place like eastern Washington--lovely in its own right, but not exactly the first place a camping newbie would think of--is a different kind of challenge, and Cherry Wood's Fewel jumped into it without being positive the idea would take. She spent "four to five thousand, easy" on erecting and outfitting each tent and wrestled a bit with the county over thousands of dollars in fees and regulations. "I asked permission instead of forgiveness," she says, chuckling. 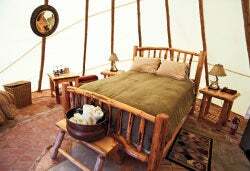 Finally, the tents were ready, and she waited to see if anyone would want to spend the night in teepees outfitted with beds, loungers and refrigerators. She didn't wait long. "People come from all over the world," she says. "It's just amazing." The main attraction at Cherry Wood remains the horseback rides to Yakima's wineries, but now Cherry Wood has taken its offerings to the next level with the addition of the Open Sky Spa, housed--naturally--in a giant teepee. 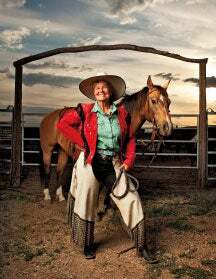 Still, Fewel is adamant her ranch will remain a ranch. "We present the ranch just as it is, a hard-working ranch--what you see is what you get," Fewel says. "I want to undersell and overperform. People want to see what it is to get back to nature, and what the earth provides." Cherry Wood's approach differs somewhat from that of Paws Up. While Lipson proudly notes that the 37,000-acre Paws Up property remains a working ranch, he doesn't mind if you go the entire visit without poking one cow. "What truly differentiates Paws Up is that we are a very high-end resort situated on one of the most beautiful ranches in the west," he says. "It's not a guest or dude ranch. We want our guests to do what they want to do when they want to do it." Having an existing ranch to build on is helpful, but an entrepreneur doesn't necessarily have to have an already successful operation to start a glamping resort. John Bogaert, co-owner (with his wife, Shelley) of the Lakedale Resort at Three Lakes in Friday Harbor, Wash., invested in "a bunch of bread-and-butter apartments" in Oregon when he decided to get into upscale camping. "Our family experience is typical of many families that have enjoyed camping as part of their travels," Bogaert says. "We realized that by not camping as much as we had in the past, we were missing sitting around an open fire and even hearing rain on a tent. So we endeavored to develop a product that could cater to others like ourselves, which, fortunately for us, ended up including a vast number of baby boomers." Bogaert purchased the 82-acre property for $4.5 million in 2005, and immediately engaged a management company, Columbia Hospitality, to run it on a day-to-day basis. "We had no experience with running a campground," Bogaert says. "We relied heavily on Columbia to give us guidance. And they would freely admit that they're learning from us, and we're learning from them--in marketing, in staffing, in the creation of product. We just constantly try to improve the details to meet our own standards of travel." By allowing Columbia to concentrate on keeping the resort running, the Bogaerts have been free to create the resort's elegant Canvas Cabins (Shelley has an interior design background and orders all the furnishings and décor), and to build and refine Lakedale's brand. They've even expanded the overnight offerings to include a vintage Airstream trailer refitted with luxury appointments, probably the first of several more. As a resort owner, you need time to think up this stuff, and it's easier to do when someone else is in the kitchen stirring the pots. Even the family-run Paws Up employs as many as 300 staffers during the summer season. It's a lesson Cherry Wood's Fewel is learning at some personal expense. "I need more staff, but I am too picky," she says. "My daughter, Tiffany, and a young man named Ryan are my main people. I do have very good help for my cleaning staff--we have two people and myself. Then again, I do a lot of it myself because I'm so picky. Bad habit to have, but it is so important to me to have things done correctly." Running a glamping resort is hard work, combining the challenges of operating a hotel and a campground (and, sometimes, a ranch as well), but the owners of Cherry Wood, Paws Up and Lakedale have no complaints. Lipson hopes that Paws Up will see a 25 to 30 percent year-over-year increase in revenue in 2011, while Lakedale, according to Bogaert, has increased its gross income by 50 percent in the last five years. But it's clear that money isn't the only motivation. "We are very content with the financial results, but beyond that, you should see the fun people are having at our resort," Bogaert says. That seems to be the common currency among resort owners: the pleasure in providing guests a great weekend in the woods. Entrepreneurial challenges don't seem so stressful when you're out in the open air, helping guests light their first campfire. How can you get worked up about business when someone is making s'mores? "You can't force something like this; it would come through in the business," Fewel says. "It's just gotta come from the heart. The guests who left yesterday were all smiles, and they had a bonfire up that was so huge, we just laughed. They never get to do those kinds of things, and sometimes I take that stuff for granted."